The GoFundMe site raising money for Jason Taylor Martinez’s struggle with bone cancer, stomach cancer, brain cancer, steel rods in his knees and back, seizures, waiting for a lung transplant and, of course, rusty blood, is still up. I’ve reported it a few times, and I know a few other people have done the same. 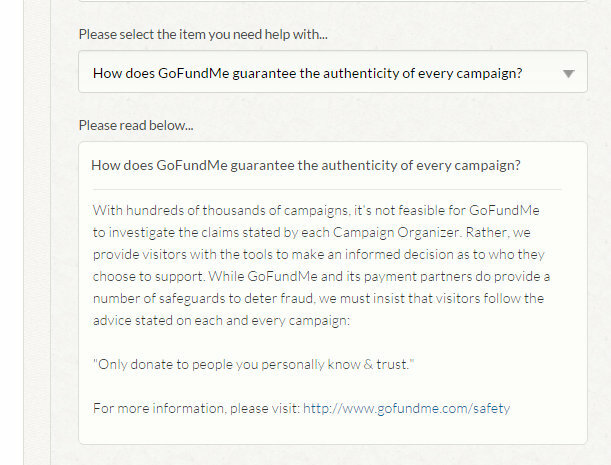 So far, I’ve had no response from GoFundMe, but they do include this disclaimer on their website about guaranteeing the legitimacy of fundraising pages. Jason and Julian made the Facebook group raising awareness of their fundraiser secret. Members of the group have questioned the couple quite a bit, including this exchange. Here’s Jason and Julian on October 24th. This picture was posted by their roommate, who tagged Jason in the photograph. 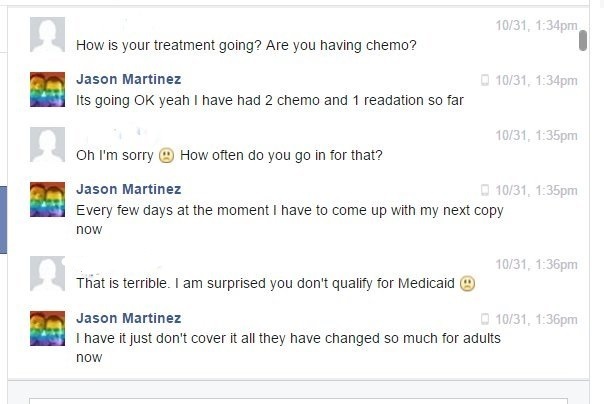 Julian’s claim that Jason hasn’t had chemotherapy since last year contradicts what Jason told me last week. He said he had chemotherapy for stomach cancer five years ago, and has had two radiation and two chemotherapy sessions lately. Will you please post some recent photos? Cancer causes horrible disfigurement. 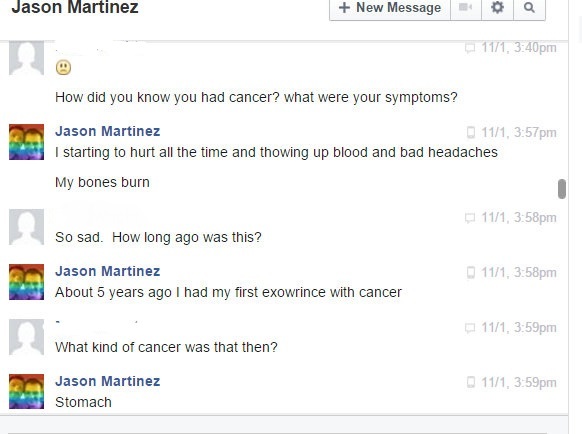 If you are telling the truth, show how bad cancer looks. I was on their FB page yesterday. The photos dated 9-7 and 9-10 were supposedly taken during being hospitalized for pneumonia, but he isn’t wearing oxygen. 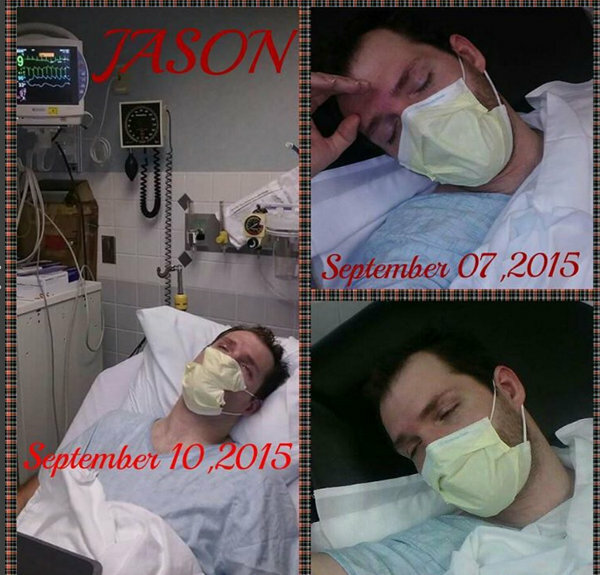 there is no way he would be in the hospital with a lung infection and not be on oxygen, especially since in other photos they claim that Jason has to be on oxygen to keep his lungs from collapsing, which is malarkey in its self. they also claim that he is having daily seizures due to the brain tumors and that he had a 105 degree fever and was still able to go to his regular Dr.. 105 fever is dangerous to anybody, and can bring on seizures itself. The whole thing stinks of BS. Why would you need $45,000 for a car and expenses? Surely you can buy a car for far cheaper then move so you have “less expenses” the entire thing is BS. My sister died from Cancer and I’m an advocat for Children’s Cancer, so I know many, many people who do have Cancer and have had Chemo and radiation or are still having treatments. Anyone who pretends to have Cancer so they can con money/items from generous people, should be locked in a room with people who’s lives have been decimated by Cancer, and then forced to go to both a Children’s and an adults Cancer unit and tell them face to face what he’s done. Unfortunately that will never happen but he should at least be arrested for obtaining monies/gifts under false pretences. Surely that’s a crime in the US? I know it is here in the UK. Has anyone been able to find the source of the photos? If they belong to someone else that will be the best way to get this shut down. It’s obviously a scam but sadly enough people are so uneducated that they don’t know that there is no such thing as “rusty blood” or the rest of this is physically impossible to have going on in this time frame let alone that recent photo of the guy standing while holding a child while being at death’s door. I believe they’re their own photos, actually. I don’t think the descriptions Julian and Jason are giving actually match what’s going on in the pictures, though. 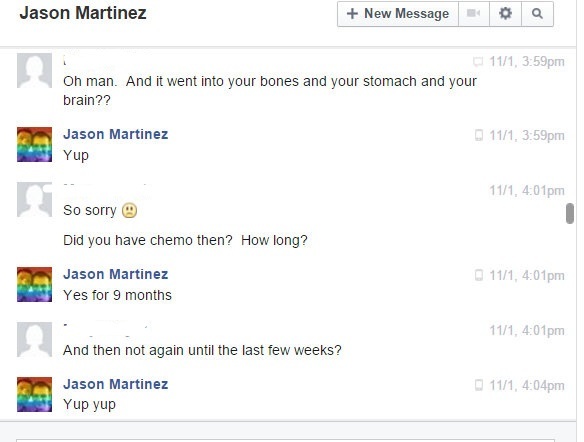 I would like to post messages that I have received from Jason Martinez. How can I post a image of combined messages? Ryan, I received them on our Facebook page. Very interesting. I responded to you on Facebook. Thank you very much! I think that’s them in the pics to as I’ve seen them online from AOL to MySpace to now facebook for years. Here in Alabama our gay community is small so we often run across each other or know OF each other at the very least of that makes sense. Anyway so yeah I think that is really them but this short!!,…. Craziness! Please guys don’t judge all us Alabama gay folks based on these two nut jobs! LOL!!! A mess!